Image1: Interface of SQL Configuration. SQLSelect Statement - Display the SQL select command. Edit the statement to add or delete fields, functions, etc. Tip: Use the SQL Builder for statement fast assembly. SQL Preparation - Enter SQL commands or procedure names to be executed before the main select. Connection - Display the (database) connection name used. This connection can be changed for another that has the same tables (SQL). 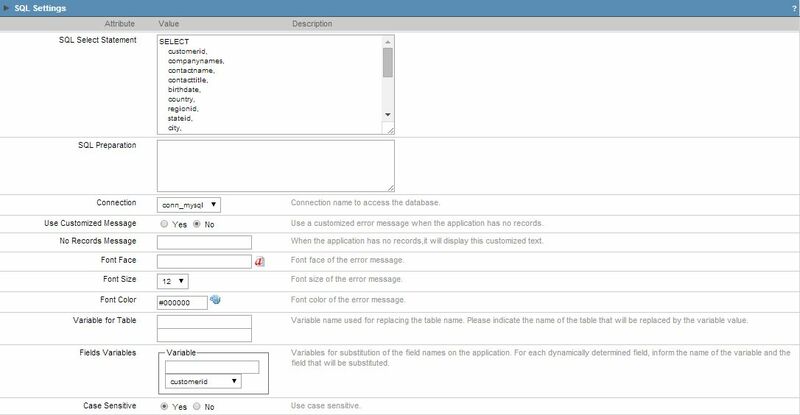 Use Customized Message - Define a customized error message to be displayed when the application has no records (EOF). No Records Message - Message displayed when the application has no records. Field associated to “Use Personalized Message”. Font Face - Error Message font face. Field associated to “Use Personalized Message”. Font Size - Error Message font size. Field associated to “Use Personalized Message”. Font Color - Error Message font color. Field associated to “Use Personalized Message”. Variable for Table - Variable name used for replacing the table name. Also inform the part of the table name that will be changed by the contents of the variable. Note: Fill the first box with the variable name. The second box must be filled with a part of the table name to be substituted. Fields Variables - Variables for substitution of the field names of the application. For each dynamically determined field, enter the name of the variable and the field that will be substituted. Note: Fill the first box with variable name, in the second select the name of the field to be substituted. Case Sensitive - Apply case sensitive.